Our mission at NurseJournal.org is to create a social community for nurses around the world in which to educate, inform and share. As part of that mission, we set out to find the best nursing schools in each region of the United States and share that information with you, our community. To determine our rankings, we evaluated 1,189 schools and selected 20 metrics, sorting them into five categories: quality, affordability, convenience, satisfaction, and value. Click here to see a breakdown of our methodology for calculating the scores. See our Disclosure below. Here are NurseJournal.org’s Best Nursing SchoolsÂ® in the Eastern Region. There are other things to consider when choosing a nursing school, of courseâthings that can’t be measured and ranked. You might want to attend school close to home, for exampleâor far, far away. If you will be attending classes on-campus, a visit ahead of time is an absolute must. Consider these rankings a jumping-off point and combine them with your own requirements to determine which nursing school will be best for you. Our mission at NurseJournal.org is to create a social community for nurses around the world in which to educate, inform and share. There is no question that the field of nursing is one of the most exciting, rewarding, and in demand professions in America today. According to the Bureau of Labor Statistics, the employment for all registered nursing will grow over 30% in the next decade, which is faster than average when compared to other occupations. We set out to find the all-around best nursing schools in each region of the United States. To do this, we sat down with our community members to talk about what we think makes a good nursing school. We took 19 metrics and put them into five categories that we felt were both quantifiable (at least to a degree) and important: quality, affordability, convenience, satisfaction, and value. NCLEX Pass Rate (10 points): It’s extremely important that nursing program graduates are prepared to pass the test that will allow them to be licensed, so we gave NCLEX pass rates double the weight of any other metric in the quality category. Institutional Accreditation (5 points): Most institutions are accredited, but there are a few that aren’t. Institutional accreditation is a long-accepted indicator of quality among institutions of higher learning. Nursing Program Accreditation (5 points): We awarded extra points if the nursing program itself was accredited. Highest Award (5 points): Generally, a school that offers high-level degrees is a better quality school. We awarded points based on the highest award level offered at each school as follows: 1 point for certificate, 2 points for Associate’s, 3 points for Bachelor’s, 4 points for Master’s, and 5 points for Doctorate. Graduation Rate (5 points): We used the percentage of full-time, first-time students who graduated or transferred to another school within 150% of the normal time for completing their programs. Quality Penalty: The Board of Nursing in each state publishes a list of schools that are on conditional status for failure to meet the minimum standards set by the Board. Because we consider this to be a very serious issue, we have applied a quality penalty to any school with this status. Tuition and Fees (5 points): The cost of tuition and fees ranges from less than $1000 to well over $20,000 per year. This is a huge consideration for many students. Financial Aid Percent (5 points): We awarded more points to schools where a higher percentage of students receive financial aid. Percent of Tuition and Fees Received as Aid (10 points): It is much more helpful to receive $5,000 in aid when your tuition bill is $6,000 than when it is $20,000, so we calculated the percentage of tuition that was covered by the average financial aid award (not including loans) and assigned points based on that percentage. Student Loans (5 points): Too many students are graduating from college with too much student loan debt. We think it would be better for everyone to have a clean slate financially when they get out of school, so we gave more points to schools with lower average student loans. Net price (10 points): This figure takes cost of living into account as well as tuition, fees, and financial aid. We gave more points to schools with a lower net price. Distance education options â undergraduate (5 points): Since many students work while attending school, distance learning options make it more convenient for them to get the education they need. We awarded 5 points to schools that have online options for undergraduates. Distance education options â graduate (5 points): We awarded 5 points to schools that have online options for graduates. Weekend/evening classes available (5 points): We awarded 5 points to schools that offer evening or weekend classes. Online or hybrid nursing program? (10 points): We awarded 10 points to schools that offer an online or hybrid nursing program. 1st- to 2nd-year Retention Rate (10 points): Since unhappy students are more likely to transfer to another school after the first year, we awarded up to 10 points based on the 1st- to 2nd-year retention rate. RateMyProfessor, Overall (5 points): We awarded up to 5 points for the overall rating on RateMyProfessor.com. RateMyProfessor, Professor Average (5 points): We also awarded up to 5 points for the average professor rating. Salary vs. Cost (20 points): To determine which schools provide the best value, we compared the highest salary for each school to the net price and awarded up to 10 points for schools with a higher payoff for the cost. Where salary information was not available, we used the median weekly earnings in the US for the highest degree level offered at the school. Most of the data used to determine our rankings came from the Institute of Education Sciences. We also gathered data from Rate My Professors, PayScale, the Bureau of Labor Statistics, the state Boards of Nursing, and individual school websites. Of course, there is only so much you can determine from facts and figures alone. Once you have narrowed down your options, ask around and try to talk to a few people who have attended each of the schools you are considering. Then schedule a campus visit to get a feel for what it’s really like. To determine our rankings, we evaluated 754 schools and selected 20 metrics, sorting them into five categories: quality, affordability, convenience, satisfaction, and value. Click here to see a breakdown of our methodology for calculating the scores. See our Disclosure below. 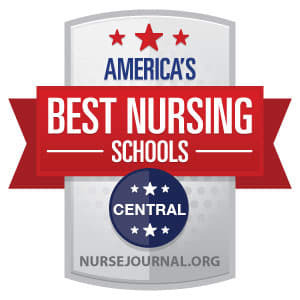 Here are NurseJournal.org’s Best Nursing SchoolsÂ® in the Central Region. Our mission at NurseJournal.org is to create a social community for nurses around the world in which to educate, inform and share. We set out to find the all-around top nursing schools in each region of the United States. To do this, we sat down with our community members to talk about what we think makes a top nursing school. So what makes a good nursing school? Good teachers? Low tuition rates? Flexible class schedules? We believe that a good nursing school provides a quality education at a reasonable cost and offers educational options that make it easier for today’s busy students to attend. To determine our rankings, we evaluated 509 online nursing schools and selected 20 metrics, sorting them into five categories: quality, affordability, convenience, satisfaction, and value. Click here to see a breakdown of our methodology for calculating the scores. See our Disclosure below. Here are NurseJournal.org’s Best Nursing SchoolsÂ® Online. We set out to find the all-around best nursing schools in each region of the United States. To do this, we sat down with our community members to talk about what we think makes a good nursing school. We used 20 metrics and put them into five categories that we felt were both quantifiable (at least to a degree) and important: quality, affordability, convenience, satisfaction, and value. Early-Career Salary (5 points): It’s nice to get a quick return on your educational investment, so we awarded up to 5 points for early-career salary. Mid-Career Salary (5 points): We also awarded up to 5 points for mid-career salary. Salary vs. Cost (10 points): And to put it all into perspective, we compared the highest salary for each school to the net price and awarded up to 10 points for schools with a higher payoff for the cost. Most of the data used to determine our rankings came from the Institute of Education Sciences. We also gathered data from Rate My Professors, PayScale, state Boards of Nursing, and individual school websites. To determine our rankings, we evaluated 496 nursing schools and selected 20 metrics, sorting them into five categories: quality, affordability, convenience, satisfaction, and value. Click here to see a breakdown of our methodology for calculating the scores. See our Disclosure below. 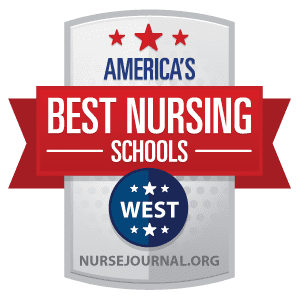 Here are NurseJournal.org’s Best Nursing SchoolsÂ® in the Western Region.